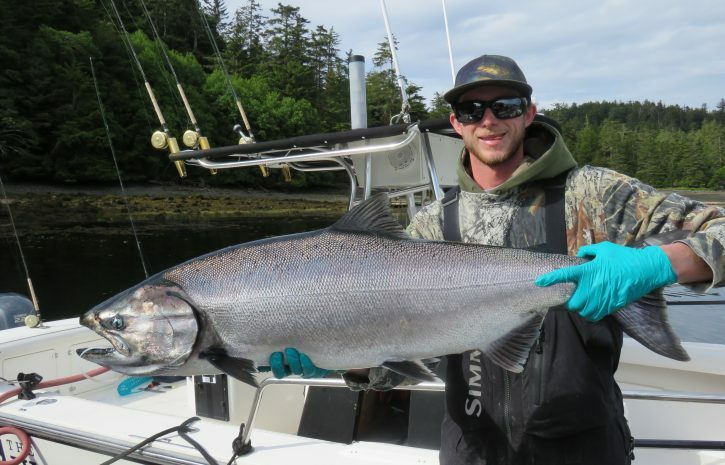 The Clubhouse Report – CHINOOK MAYHAM! 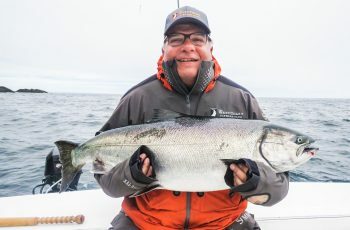 Redonkulous, crazy, wild action at times on the west side of Langara, as the chinooks are blowing by the western rocks and bottlenecks, swarming in on the massive bait piling up in all the usual haunts. Yes, fishing for chinooks the last few days here at Langara has been awesome at times, today we had a four our bite that almost wiped me out. I was fishing today with Mike Throne and son John and we headed out west in the am. Two meter swells greeted us and a thick mist but hey, we had the rock to ourselves. First hour I was feeling like I blew it, but radio fisherman were all calling, looking, reports were being filed on the minute. No early bite. Soon though, an acre of bait washed in and I turned my radio volume on low, we are staying put. Out comes my jig rod, nice Calcutta reel thanks to Kenny Tsang at Nikka, talked me into four of them. 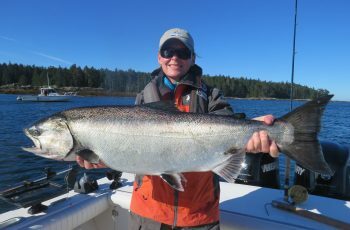 Soon had young John practiced up and catching super hawg herring, 22 cm. long, make a gillnet fisherman green with envy. We were swinging in heavy lifts of herring to use later for bait, so purple in color, very cool. Yes moments later, double header insued, then one chinook after another. A NIL boat soon appeared and got on the blower calling the bite for the whole island, dammit! Tommy from next door swooped in and hooked a good fish, but familiar story, a sea lion wiped it out right at the net. Soon after, Mike hooks a very interesting fish, screaming madly, but dammit, ten minutes in a rock dog latched on, it was over. Kory stormed in like he owned the place and proceeded to hook a dozen springs right in the mix. Miracle fed the rock dog lunch about ten times in a row. Jordie hooked a good one, but that was eaten too, not by Jordie, he had fresh supplies from the candy boat, but rather the same dog! The boys slipped in for lunch but we stayed and the chinook fishery exploded on us ha-ha, one fish after another, mostly high teeners low twenties. One rod fishing at a time for like four hours, my hands! As Steve French would say, like the old days! We were grabbing seven to ten fish an hour, heavy hauling all systems go. Mooching rods on fire out the back, fresh bait sizzling, chinook acting like snapping turtles on a feeding frenzy, it was a show. At one fourteen pacific standard time John had a stern mooching rod buckle, dipped his rod, and hammered the tar out of a nice fish, ending up being 33 lbs, first fish to swim in my new live tank, the HIPPAQUARIUM, reserved for all tyees, a private club for fish over thirty lbs to be revived and released, yes, this monster pit is ideal for a tyee pit stop. 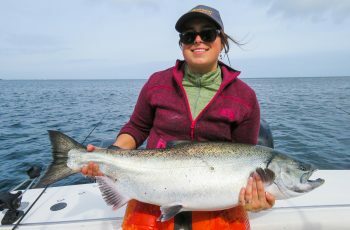 Get that monster swimming strong and back on her way where she belongs, enjoying a last year of life in the wild pacific, before heading home to spawn and making all of us proud as anglers. 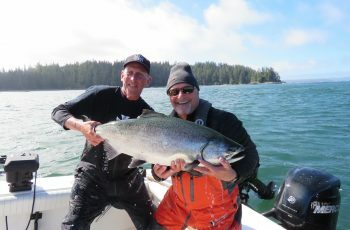 We hammered the tar out of em for four hours, grabbing chum and a half dozen coho as well, the west side was on fire. Yesterday I visited the graveyard, Carew rock and what a crazy fishery, absolutely on fire, springs stacked like cordwood. The swell was monstrous, danger in every corner, a guy had to keep his wits, wow was that swell massive, downright hairy,pounding all the reefs and actually scaring me a tad. Bud was scared a bit too. That is a good guide, one who respects the sea and the danger it can throw at you. 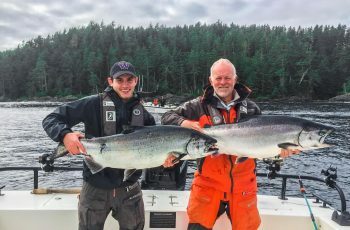 Springs in the teens, so many you could not keep track, bait in the tonnes, massive herring balls, wicked tides and chinook numbers I will not soon forget. yes we were beaten silly, who likes groundswell? That is why we fish Langara, to hide from this sea, she was angry, but the springs were rolling by for over five hours! So not big fish by some anglers standards, but we have had guide boats into 50 fish…chinooks, on the day! I love this fishery, and this is the June bonus, massive early feeding runs, and they are here now! Sooo glad to read this report. Sounds like the good old days for sure!! Look forward to seeing the hippaquarium! !